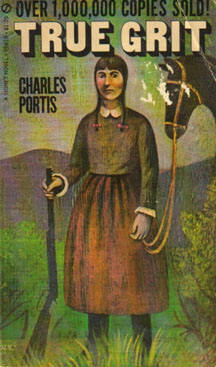 In 1968, Charles Portis created one of the most memorable characters in Old West history - Rooster Cogburn, when he wrote the serialized novel True Grit, which had such immediate popularity that it spawned a blockbuster movie less than a year later starring none other than the Duke himself, John Wayne. Unbeknownst to Mr. Portis, the book was also responsible for spawning the greatest of all the legends told about Cal Whitson. I was twelve years old at the time and very clearly remember the speculation the book started amongst family members. You see, the character of Rooster Cogburn was based on a deputy marshal riding for Judge Isaac C. Parker (the hanging judge), and that deputy's most prominent feature was a missing eye. Well it just so happens that Cal was the only known one-eyed marshal to have ridden for the famous Judge. Although it is possible that Mr. Portis' character was complete fiction or merely a composite of the characters of many different marshals, the similarities are compelling. And so, for nearly forty years now, the Whitson clan has kept the legend alive. If you ask any one of us, we will be more than happy to tell you that, yes indeed, Cal Whitson and Rooster Cogburn are one and the same individual. I mean, who wouldn't want to claim John Wayne as a great-granddaddy?